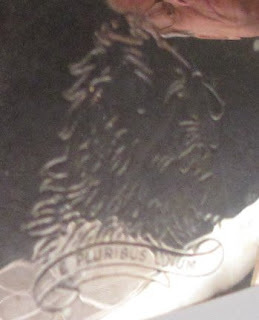 Another one of the “not real” heraldry we saw at the antique store that Saturday was a piece of silver with a “crest” engraved upon it. The reflections were pretty strong, and it may be a little more difficult to make out what this is, but it’s a lion’s head erased contourny (turned to sinister), with a scroll beneath it with the motto: E pluribus unum. Still, it was a neat thing to run across. 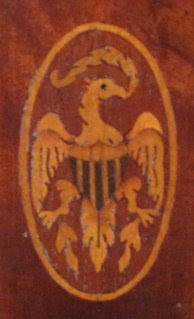 Not quite real, but moreso than the lion’s head crest, was a cabinet with an inlay version of the arms of the United States (Paly of thirteen argent and gules, a chief azure) on the breast of a bald eagle. There’s only nine stripes on the shield instead of thirteen, and the eagle is facing sinister instead of dexter, but it’s a beautiful piece of inlay work nonetheless, don’t you think?